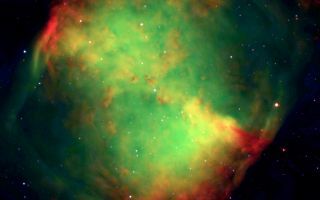 The Dumbbell Nebula ­— also known as Messier 27 or NGC 6853 — is a typical planetary nebula and is located in the constellation Vulpecula (The Fox). This space wallpaper shows the Dumbbell Nebula ­— also known as Messier 27 or NGC 6853 — a typical planetary nebula located in the constellation Vulpecula (The Fox). The distance is rather uncertain, but is believed to be around 1,200 light-years. It was first described by the French astronomer and comet hunter Charles Messier who found it in 1764 and included it as no. 27 in his famous list of extended sky objects  .Despite its class, the Dumbbell Nebula has nothing to do with planets. It consists of very rarified gas that has been ejected from the hot central star (well visible on this photo), now in one of the last evolutionary stages. The gas atoms in the nebula are excited (heated) by the intense ultraviolet radiation from this star and emit strongly at specific wavelengths.